If you are organizing an event, you would make tees for the event together with badges. It would make your event with identity and the badges would be a very good souvenir for the participants. For school organization, tours, promotion activities, etc…badges can be used to make the members more out standing from the mass. 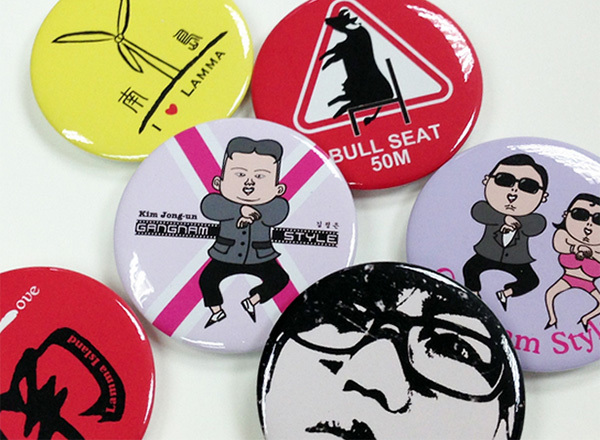 You would also design your own badges as a gift to your beloved one. All you need is just to provide the photo/ image you would like to print on the badge, and we would make the badges for you. All the print is in full color. The badges can pin on the chest or on the backpack. It would be just like a fashion. Besides badges, we also make 5.8cm diameter bottle opener too. Quantity(pcs) 2.5/ 3.7cm Dia. 5.8cm Dia. 7.4cm Dia.